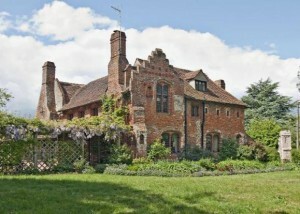 The listing says: Grade II listed Tudor house which incorporates many original Elizabethan features including crow stepped gables, a niched buttress and inset Flemish terracotta plaques. Being the former priory of the Holy Cross of Whelnetham, founded in 1274 and suppressed in 1536 it is believed to be one of Suffolk's oldest monastic houses. And it's so pretty! A lovely house!